This universal keyboard provides a single input device for the four major operating systems. The layout essentially replicates your laptop’s keyboard. There’s a full set of alphanumeric keys, a set of system-specific function keys, and a Windows button that doubles as a MacOS/iOS Command key. Above the keys are LED status lights for the Caps lock, Bluetooth pairing, charging, and battery life. 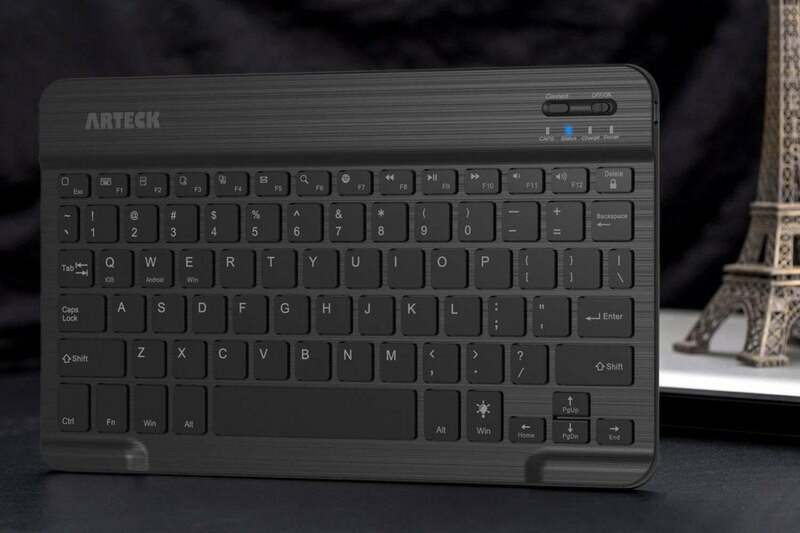 The Arteck HB030B Wireless Bluetooth Keyboard supports Windows, MacOS, Android, and iOS devices. Pairing the keyboard is as easy as pressing the “Connect” button next to the on/off switch and selecting Bluetooth keyboard 3.0 from your device’s Bluetooth menu. This worked as expected when I connected the HB030B with my Windows laptop, iPhone, and Android phone. But when I paired it with my MacBook Air, the keyboard showed up as a string of numbers, and then only when I opened my Bluetooth preferences. Not sure if this was unique to my experience or if it’s a quirk of MacOS, but it’s worth mentioning. It’s also not clear if you can pair more than one device at a time. The “Q,” “W,” and “E” buttons are also labeled “iOS,” “Android,” and “Win,” respectively, which seems to suggest you can toggle between the three systems. But neither the provided user manual nor the website make any mention of this that I could find. Whenever I tried to pair two devices, the first would disconnect as soon as I paired a second, so it would seem to only support one device at a time. And I couldn’t simply reconnect a previously paired device; I had to delete/forget it, and then re-pair it. Keyboard backlighting isn’t particularly novel, but the opportunity to select the color of the light is. The HB030B includes a choice of seven backlighting hues: cyan, light green, purple, soft blue, dark green, deep blue, and red. You activate the backlight by pressing the function key plus a dedicated backlight key, then press those keys again along with the up or down arrow key to cycle through the colors. The lighting will turn off after about 45 seconds when the keyboard’s not in use. Unlike some keyboards that have a built-in motion sensor that triggers the light back on when your hands approach the keys, the HB030B requires you to use the key-combo above to turn its light on again. Designed as it is for limited use in on-the-go scenarios, the HB030B makes no concessions to typing ergonomics. It sits perfectly flat on the desk/table surface and it’s too compact to include a palm rest. The absence of a 10-key pad makes it unsuited for number crunching. These aren’t knocks, just things to be aware of. If you’re a fan of typing feedback, you’ll like the satisfying thump and click each key delivers when pressed. Key travel was comparable to my laptop keyboards and I had no problems with keys sticking or missed keystrokes. Because of the condensed size, though, the keyboard isn’t particularly roomy. In the home row position, all four fingers on each hand were in contact with each other. It didn’t affect my typing, but I’m not a fan of the cramped feeling. For the price, the Arteck HB030B offers mobile typists plenty to like. The connectivity quirks I encountered can be a drag if you switch frequently between devices and operating systems. More likely, you won’t, however; and in that case this keyboard will serve you well. 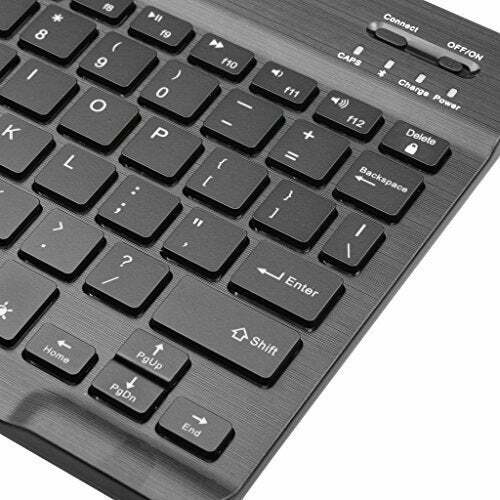 This story, "Arteck HB030B Wireless Bluetooth Keyboard review: A multi-device keyboard for mobile typists" was originally published by PCWorld. The Arteck HB030B Wireless Bluetooth Keyboard is a good option for mobile, multi-device typists.